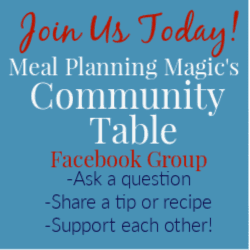 Six Games and Ideas to Help Make Dinnertime More Fun! Eating together as a family might seem like an insurmountable goal these days in our busy lives of being on the go, but it’s something I truly believe in making a priority. It may come as no surprise that I think with a little meal planning, getting dinner on the table can happen more easily. Dinner may not always be at the same time every day, but with a little adjustment, making time to sit down together CAN happen! Still think you’re moving in too many directions for dinner time together to happen? Then consider making breakfast your family meal or make a goal for at least one day a week to be your family meal time. Whether you’re cooking from scratch or not, it’s the time together, with the electronics tuned off or put aside, that can truly make the difference. (P.S. one bonus of home-cooked meals though is spending more time in the kitchen making it!) What is important is to be together, not who prepares the meal or what is being served. Some of the biggest problems facing families today are childhood obesity and accompanying disease, teen substance abuse, and the erosion of family connections due to the ever-increasing intrusion of electronic devices. All this from something as simple as eating family meals together, even if it’s just one or two times a week! ● According to Pew Research (2010), only about half of families make dinner a daily ritual and another third eat together a few times a week. Roughly one in 5 families eat together only occasionally or never. Some families find it challenging getting conversations going at the table, especially with a variety of ages. Maybe not everyone is a talker. Or maybe one person IS the talker and talks the whole time. Providing opportunities for everyone to participate in the conversation will make for even deeper connections in your family. 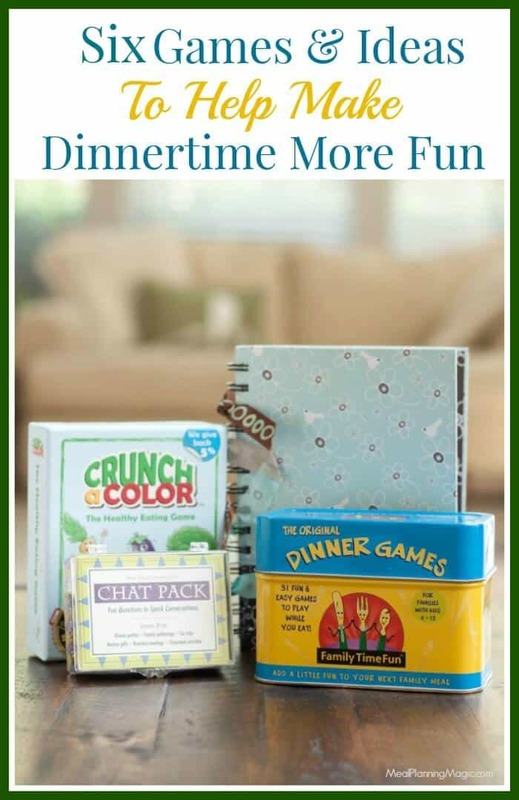 Today, I’m sharing with you Six Games and Ideas to Help Make Dinnertime More Fun! These are games and conversation starters that my own family enjoys. Every day is a little different so mixing things up every so often is ok! This is super easy to do! Everyone takes turns sharing one high point of the day and one low point of the day. some people call this game Thorns (the lows) and Roses (the highs) Allow time for questions and extra sharing about what made those moments notable. This is not the time for criticism, rather it’s a good way to provide feedback–if wanted–in a helpful or positive way! This is a super simple game to play—it’s just a fun question and answer game to see how well you know each other! • What is my favorite class? • What do I usually play at recess? • Who are my two favorite friends at school? • What is my favorite TV show? • Where was I born? • What was my favorite subject in school? • What sports did I play when I was a kid? • What cities have I lived in? The Thankful Journal is something we started when my kids were both in elementary school. I just purchased a simple journal at the (used to be) dollar section at Michael’s but you can use any notebook or journal. The point is for each family member to take a moment and think about something they are thankful for that day. We’ve not been as regular about using it more recently so I pulled it back out of the drawer to start using again. Remember, no judgement about what someone is thankful for. Maybe a younger member of the family may be thankful for a new toy or game or perhaps another is thankful they got a good grade on a test they were nervous about. Don’t forget the adults! They might be thankful for reaching a big goal at work or simply getting all the housework done earlier than usual! It is fun to go back over the months and years to read about what was important to someone at the time and see how things change. The Crunch A Color Game is fun to play if you’re interested in having your family eat more fruits and vegetables. The concept is simple: earn cards with points for eating healthy foods. Fruits and veggies give you the most points. Bonus points are given for things like trying a new food or helping to set the table or use good manners. The winner is the one who eats foods to earn the most points (and usually the most variety will give you the most points). Being that my children are somewhat competitive, this was right up their alley and actually works most times to get them to eat a greater variety of foods. Designed by a mom for parents, this game hits the mark on encouraging healthy eating habits. I purchased this Family Time Fun Dinner Games and Activities game several years ago and it’s still a favorite! Not that we need conversation starters so much but it is fun and my kids love to pull out the cards and ask the questions. Sometimes the questions encourage taking an extra bite of food while others are just for fun like, A, B, City where the first person starts by naming a geographic location that starts with the letter A, the next starts with B or the Acronym Challenge where the person who’s it names their favorite foods to spell out their name. The version I bought is for kids ages 6-12 (and adults of course) while the other version is for kids ages 3-5. “If you were asked to create the ultimate vacation destination, where would it be located and what would it be like?” or “If you could see the front page of a national newspaper dated January 1, 2100, what do you imagine that the main headline might say?” or “If you were completely deaf but were somehow able to hear for one hour each month, what would you most often want to hear for that hour?” There are several different Chat Pack versions that are good for younger ages, adults only and a few in between! So how do you make dinner time more fun and get the conversations going? Feel free to add your own suggestions in the comments section! Disclosure: This post includes Amazon Associate affiliate links. That means, if you choose to purchase any of the items here using the links, a small percentage of that sale will be sent to me at no additional cost to you. Thanks for your support!